The Michigan roads are being plagued with enormous craters AKA “Potholes” that would put the moon to shame! It’s ridiculous! I see you on the roads swerving and slowing down. All of us trying to avoid damaging a tire or worse yet breaking a tire rod or throwing your wheels out of alignment! The freeway should ers are filled with stranded motorists dangerously assessing the damage and waiting for tow service. Simply put, our infrastructure system is broken when the “motor capital of the world” doesn’t have safe roads to accommodate the very vehicles they build. We have become a laughing stock across the nation and photos of our plight have actually gone viral. We can do better! 1. There is a way to put in a claim for those damages depending on which road (City, State or County) you were on at the time of the incident. We hope this information can help you recoup some of what you have lost. 2. You can also support me in my campaign! As State Senator, I would commit to benchmarking surrounding Midwest states with similar weather patterns to learn best practices for maintaining and servicing their roads. I also will ensure that the budget for road repair and construction is not only funded appropriately but managed effectively. We can do better. Help me make sure that happens! If you would like to be a part of future A-Team events or host a party, or maybe volunteer by making phone calls, please email me at adam@adamhollier.com or register here. I need your help! 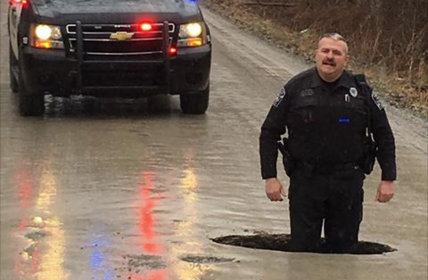 Pictured: Grand Blanc Law enforcement officer knee deep in a Michigan pothole. This entry was posted in Adam on the issues and tagged 2nd District, Adam Hollier, infrastructure, Michigan, Politics, potholes, roads, senate. Bookmark the permalink.